The Ranch Acres Historic District is an excellent example of an intact post-World War II ranch house subdivision. It has a high degree of integrity with almost ninety percent of the residences contributing to the district. Jacobson had been approached about buying property “way out in the country” by Ben Kirkpatrick. Kirkpatrick owned a Tulsa real estate investment company and his suggested site was East 31st Street and South Harvard Avenue. Part of the first Ranch Acres plat was owned by the Sand Springs Home, oilman Charles Page’s investment organization used to fund an orphanage. The area was undeveloped and Page had used the area for hunting and riding. There was also a small lake present near what is now East 38th Street and the 3700 block of South Florence Place. Kirkpatrick purchased the Sand Springs Home property in 1949 and transferred it to Jacobson almost immediately. The area was outside the city limits at the time, but the march of homes east and south of Tulsa was moving in the same direction. The engineering company of Owen and Mansur was hired to lay out the subdivision in the hilly area, platting streets and lots for construction. Owen is credited with going out of the way to preserve trees and the natural contour of the land. He accomplished this by laying out gently curving streets and developed housing plateaus along these streets which emphasized the natural beauty of the acreage. Jacobson also believed that the extensive wood areas and rolling topography would bring out the best in residential design and many of the lots would enable a family to create a protected “country estate” since the tract had many large native pecan trees. Jacobson filed Ranch Acres Plat 1 in September 1949, and immediately built five houses to sell. He began to promote the area by hosting free barbeques to attract potential buyers. He also built a house at the corner of East 31st and South Gary Place as a real estate and construction office, and the house is still used today as a dentist’s office. The immediate success of Ranch Acres was evident in sales, and in early 1951, Jacobson’s company began to purchase property for Plat 2 which was filed in October 1951. Within five years, Jacobson had purchased all of the property from 31st to 41st, which included 182 acres. Plats 3 and 4 were filed in 1953, and 1956. 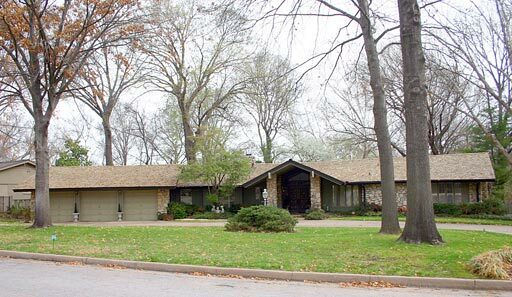 It became largest single development of post war luxury homes in Tulsa. Ranch Acre homes were not inexpensive – they ranged in price from $25,000 to $100,000 in 1954. In today’s dollars the prices would be from $210,000 to $850,000 which are well above what most average home buyer could purchase now or then. It is little wonder that the neighborhood attracted Tulsa’s up and coming professionals and businessmen, those who could afford to purchase their ideal home for modern living. Sales were also helped by the construction of a new school, Edison, which was finished in 1954, just south of Ranch Acres on East 41st Street. By 1954 Jacobson had constructed the last of the houses he would build in the neighborhood in just a five year period. Jacobson had a vision for Ranch Acres though that included more than just the housing tract. He envisioned a shopping center nearby so that residents could shop close to home. In 1953 he announced his plans for both a new medical and shopping center just east of Ranch Acres. He finished both the half million dollar Ranch Acres Medical Center and the two and one-half million dollar Ranch Acres Shopping Center in 1954. The exterior of both the medical and shopping centers conformed to the decor of Ranch Acres neighborhood, visually uniting the neighborhood with commercial and service buildings. Ranch Acres was placed on the National Register of Historic Places on December 12, 2007 under National Register criteria C. Its NRIS number is 07001268.